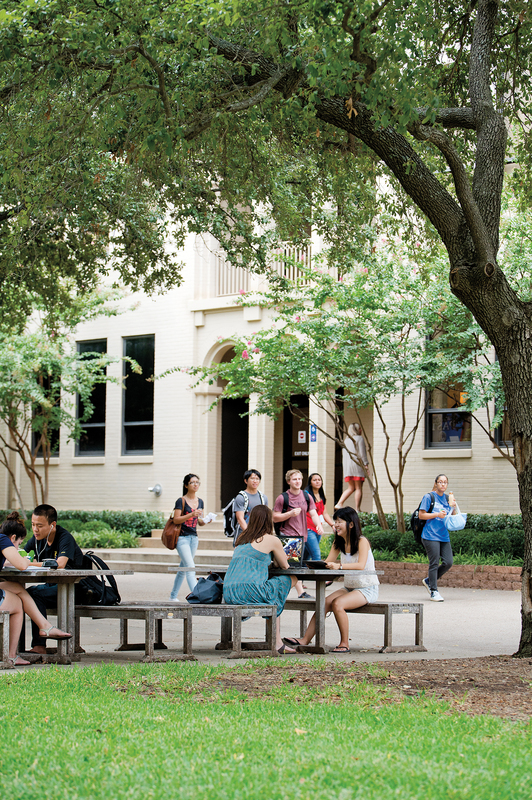 The University of Texas at Arlington traces its history back to 1895, with the establishment of Arlington College near the location of the current E. H. Hereford Student Center. At the time, the college’s location was one mile southwest of the city limits of Arlington, a town of only 1,000 residents. Today the university is in a bustling and vibrant metropolitan area, the largest and most populous in the state. The evolution of the school mirrors in many ways the growth and development of the Dallas–Arlington–Fort Worth metroplex, going from a school whose educational programs focused on military school discipline and rural-leaning educational programs to today’s modern, urban, research university striving for national prominence like the region that surrounds and embraces it. The history of the school can be divided into three distinct periods. The first period dates from 1895–1917, when the various schools that opened onsite were private and intended to offer an alternative to parents who did not want their children educated in public schools. The impetus for opening the first school, Arlington College, came from local Arlington merchant Edward Emmett Rankin. It was Rankin who recruited Lee Morgan Hammond and William M. Trimble, the two co-principals of the then Arlington Public School, to start the private school. The community threw its support behind these efforts, and the school opened in September 1895. From this opening there was a succession of schools on the site, including Arlington College (1895–1902), Carlisle Military Academy (1902–1913), Arlington Training School (1913–1915), and Arlington Military Academy (1915–1917). In today’s terms, these schools were not colleges at all but rather schools for children in primary, intermediate, and secondary grades. Each of the schools opened with great fanfare but eventually failed when sagging enrollment caused financial and legal problems forcing closure. In the end, the Arlington community proved unable—or unwilling—to provide the necessary support to keep the private schools operating. The year 1917 marked the beginning of the second period in the school’s development and a major turning point when educator and lobbyist Vincent Wood- bury Grubbs led the efforts in Austin to open a junior college in Arlington as an extension of Texas A&M. This idea had been discussed locally for more than a decade, but Arlington leaders only mustered the resources to hire Grubbs in 1917 to work on their behalf. The Texas legislature responded favorably to the idea, passing a bill that Governor James Ferguson signed calling for the establishment of Grubbs Vocational College as a “Junior Agricultural and Industrial College.” In return for the college and the state funding that went along with it, the citizens of Arlington had to donate one hundred acres of “good tillable land” to the state and the “Carlisle Military School property, with all buildings, dormitories, barracks, etc., belonging thereto” (Texas Legislature, 1917). Under Texas A&M the college experienced tremendous growth and development, going from a two-year junior college focusing on agricultural, vocational, and basic education to a four-year college, beginning in 1959, with the advent of baccalaureate degrees offered on campus. Similar to the first period of the college’s history, the school had a few different names during its time with A&M. These names included Grubbs Vocational College (1917–1923), North Texas Agricultural College, called “N-tack” for short (1917–1949), and Arlington State College (ASC, beginning in 1959). Enrollment grew from a meager 66 students in September 1917 to more than 11,000 in the mid-1960s when the college left A&M. The physical plant grew as well, to accommodate the college’s increasing enrollment and broadening status as a senior-level college. Many of the oldest buildings on today’s campus were constructed during this period, including Ransom Hall (which was the Administration Building of Grubbs, completed in 1919), College Hall (which was the Library beginning in 1926), and Preston Hall (built as a Science Building, completed in 1928). The college also reached the pinnacle in sports, as its football team, the Rebels, won back-to-back Junior Rose Bowl championships in 1956 and 1957. Also, in 1962, ASC became the first school in the A&M System to integrate its student body, allowing African-Americans to register for the first time. resisting this pressure. Local leaders in the North Texas area led the efforts in Austin to move ASC from one system to the next, and surprisingly, they got little resistance from A&M officials who welcomed the change and an end to the controversy. As a result, in 1965, the Texas legislature passed, and Governor John Connally signed, a bill transferring ASC to the UT System. The move to the UT System began the third period in the college’s history, the UT years, which date from 1965 to the present. ASC joined the UT System in 1965 and underwent its last name change in 1967, becoming The University of Texas at Arlington, or UTA to most people. The UT years have seen phenomenal growth at the university in every area. There are now more than 28,000 students who attend the university pursuing bachelor’s, master’s, and doctoral degrees in 180 different programs. And the university’s 140,000 alumni are spread across the globe. The campus has shaken off its “commuter school” image and has become a residential campus, with one-fourth of its students living in student housing and a considerably higher percentage living close to campus. Today’s UTA students come from around the world to pursue an education. It is estimated that the university has a $1 billion annual impact on the economy of the region. The physical plant, too, has grown to cover 420 acres and include more than one hundred buildings in Arlington and Fort Worth. The university is one of seven emerging research universities in Texas pursuing Tier 1 status and national prominence. This would not have been possible without a faculty who aggressively pursue research grants and external funds to expand the boundaries of knowledge and graduate students who carry out exciting research projects. A constant theme throughout the history of the university has been its close ties to the local community and the support it has received, and continues to receive, from it. Virtually every major change the university has undergone (such as its founding, or its joining A&M or the UT System, or its senior college status) has been either sponsored, supported, or initiated by the community. In real estate, agents always say that “location, location, location” determines value. This has certainly been true for UTA as its location and the community that it is a part of have served to shape and define the university.